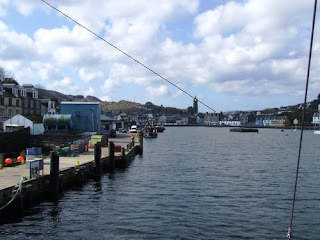 "Tarbert" is a word describing a narrow piece of land separating 2 bits of water - narrow enough that the crew of a viking longship could carry it on their shoulders till it reached its natural element. There are a number of places in Scotland which have this name or variants such as Tarbat or Larbert, all on such land bridges. It seems to me a serendipitrous name for a site from which we can transport material destined to cross space the comparatively short distance to orbit. A couple of days ago I wrote of the difficulty of finding sites in the southern hemisphere which would allow a balanced pairing of Space Elevators in the northern. I ended with the fact that the island of St Helena at 5.45 degrees west is on a line that goes through Spain, the tip of Cornwall & then Scotland, going through the Island of Arran, the Tarbert at the point where Kintyre is nearly bisected & then north past Oban. Tarbert is on the intersection of the latitude line & the shortest tunnel route from central Scotland to Kintyre. Long ago I proposed the Scottish Tunnel Project whereby, in a rather smaller scale than Norway has done over the last few decades, we could bring the Scottish Highlands & Islands within easy driving distance of our industrial heartland. Combing the 2 gives this map With new tunnels (red) & linking new roads (blue) Tarbert moves from being an isolated village nearly 200 miles by narrow roads to somewhere about 50 miles & less than an hours drive from Glasgow & the motorway south. Its current undeveloped state makes it all the easier to build a modern centre particularly if given Special Economic Zone status. With there being only 2 islands in the southern hemisphere matching points in western Europe it could be the great 21st century city of western Europe. Additionally develop a collection. You could import your vivavideodownload.co data prior to mounting it on your Android tool.